So says this song. I don't know about that, but he certainly has the gift of Blarney... so there may be something to it. Patriarch Alexei II reposed today. He will be best remembered for two things: 1. He presided over the revival of Orthodoxy in Russia after the collapse of the Soviet Union, and 2. He played a key role in bringing about the reconciliation of the Church in Russia with the Russian Orthodox Church Outside of Russia. Memory Eternal! A homosexual mob attacks a group of Christians in San Francisco. Read more about it here. You can also read Michelle Malkin's post on this. They have also been picketing Churches... particularly Mormons, because the fact that they are outside of the religious main stream makes them an easier target. But they have also been attacking blacks, who voted overwhelmingly against gay marriage. They have even invaded Church services: click here to listen to Family News in Focus on this. Where are the liberals who always speak about tolerance and freedom of speech? Next time there is a ballot measure like this in California, I think Christians all over America need to donate for the pro-family advocates. We cannot allow these homosexual fascists to bully anyone who dares to express views which reflect traditional values. Marxism... not the Change we need. I happened to catch this interview on the radio, and found it very interesting. Dion DiMucci was a rock star in the 60's, but after having acquired everything a man could want in this life, he was empty. Click here, to listen. "In an act of breathtaking injustice which the Obama campaign lied about until critics produced documentary proof of what he had done, as an Illinois state senator Obama opposed legislation to protect children who are born alive, either as a result of an abortionist's unsuccessful effort to kill them in the womb, or by the deliberate delivery of the baby prior to viability. This legislation would not have banned any abortions. Indeed, it included a specific provision ensuring that it did not affect abortion laws. (This is one of the points Obama and his campaign lied about until they were caught.) The federal version of the bill passed unanimously in the United States Senate, winning the support of such ardent advocates of legal abortion as John Kerry and Barbara Boxer. But Barack Obama opposed it and worked to defeat it. For him, a child marked for abortion gets no protection-even ordinary medical or comfort care-even if she is born alive and entirely separated from her mother. 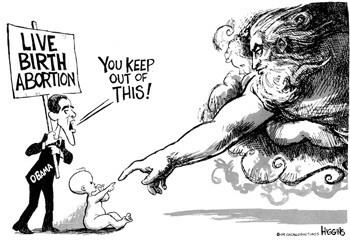 So Obama has favored protecting what is literally a form of infanticide." I would also encourage you to read the non-partisan Factcheck.org article on this question. Obama is more extreme than Ted Kennedy, John Kerry, or Barbara Boxer on the Abortion issue. He is now trying to paint himself as a moderate on the issue, who supports banning late term abortions. But he could not even bring himself to banning "abortion" during the fourth trimester... by allowing a baby who survived a botched abortion to die... as happens on a regular basis in abortion clinics in America. He has absolutely no record of actually opposing abortion under any circumstances, when he has had to actually vote on such an issue. I have been listening to Dr. Eugenia Constantinou's podcast "Search the Scriptures" for some time now, and heartily recommend it. I would also recommend you read her compilation of quotes from St. John Chrysostom on the importance of studying the Scriptures. One aspect of the conference that I should mention is that parallel to the adult portions of the conference, they had youth activities as well. My children were unable to come, but those I spoke to who had children there said they enjoyed it very much. On Friday evening, after Vespers, they had a picnic at an amusement park, and the children had even more fun... and the adults had some fun too. After the lecture on Saturday, things began to wind down as far as the Conference was concerned. Many clergy began heading home. I planned on staying through Sunday because I was originally scheduled to speak on Saturday myself. I am glad I did. The Saturday evening vigil had some features I had not seen up to this point. For one, during the Vigil they chanted the Gospel Commentary, which is an Old Rite text that I was already familiar with (it is a great resource for preparing for a sermon on those readings). It contains homilies on the Gospel readings for Sundays and feasts. It is a lot like the commentaries of Blessed Theophylact, except these are not just commentaries, but actually homilies rooted in commentary. The text was not simply read, but chanted. I also noticed more local parishioners in attendance at this service. On Sunday morning, the newly consecrated Bishop John (Berzins) presided over his first hierarchical liturgy. The Church was very full, and afterwards we all went to the parish hall for a very large scale trapeza, at which Fr. Pimen recognized those in the parish who had helped to pull off the Conference. The Conference speakers were also given three gifts, all books published by the parish: The Gospel Commentary, a copy of the second edition of the Old Orthodox Prayer Book (which is in both English and Slavonic), and their new Old Rite Horologion. All three of these books are publications of the highest quality -- no corners were cut. The binding, the paper, the ribbon markers... I am suspect that the parish has not made a profit off of them, but as with the conference itself, sacrificially invested their resources out of love for God. The primary purpose of these texts was for their own parish use, although there is much outside interest in them. I would recommend the prayer book to any pious Orthodox laymen... and I think the contents it has should serve as a model for other prayer books. It has extensive troparia and kontakia (though not exhaustive), and many services for lay use that are not published in English elsewhere. Also, the Slavonic and English texts on facing pages is especially useful for those in parishes were English and Slavonic are used together... or where only Slavonic is used, and non-Russian English speakers happen to be in attendance. The Horologion is something that any liturgical nerd would want to have, and just to have a text with all the troparia and kontakia of the yearly, festal, and tonal cycles makes this text worth getting. I left the conference feeling a definite connection with the community there. They are very pious folks, very hospitable, and their parish is a place that everyone should try and see for themselves. I don't know when they might host another conference like this one... but when they do, I would recommend going. The recent events in Georgia are quite sad. All sides are historically Orthodox Christian peoples. The media has generally only been presenting one side, and neo-cons seem to be trying to bring back the good old days of the cold war... making Russia out to be the Soviet Union, all the while ignoring Communist China which poses a real and gathering threat to the west. But while the media is exaggerating the hurt done to one side, and ignoring the hurt done to the other, the fact is that in war incredible misery and pain are the inevitable result, and so the use of military force should always be used only as a last resort. Shakespeare best described the horror of war with the words he put in the mouth of King Henry V, at the siege of the city of Harfleur. Of heady murder, spoil and villany. Fr. John Berzins (now Bishop John), reading his confession of Faith on the eve of his consecration. At the Vespers on Thursday, the Old Rite clergy from Russia began serving a full cycle of services, with the local Old Rite clergy taking a back seat, so as to observe them. One of the benefits of the Reconciliation between the Russian Orthodox Church Outside of Russia and the Church within Russia was that now our Old Rite clergy could serve together. Unlike the parish in Erie, which had been priestless until the 1980's, some of the Old Rite parishes in Russia had been reconciled for two centuries, and so had a living tradition of serving priestly services in the Old Rite that our Old Rite clergy were eager to observe, to see if there were any refinements to their own practice that were needed. These services were all in Slavonic, though despite the fact that the parish in Erie normally uses English now, their command of Slavonic was still quite good, and their own choirs with the help of some of the folks from Russia were able to chant the services without any noticeable difficulties. I should also note that the Old Rite guests from Russia had been chanting the services in English, in Znamenny chant, and despite the fact that they had never sang in English before, they fit in quite well in English too. One other thing that was going on this week was that a long time parishioner in Erie had passed away. After the Liturgy on Friday morning, Fr. Pimen conducted the funeral, while the conference attendees went back to Mercyhurst for Lunch. Immediately following Lunch was a talk by Matushka Ann Lardas. With about one minute to spare, Fr. Pimen appeared at the podium, without appearing tired or flustered, to introduce Matushka Ann. He had a cup of coffee in hand, and I suspect that this was the only nourishment he had had after the liturgy. All during the week, it was a sight to behold to see Fr. Pimen's unending energy as he made sure everything went smoothly. The conference itself was more than most priests could have handled. Throw in a funeral, and even the best priests would generally begin to unravel... but Fr. Pimen is the Energizer Bunny of priests. Matushka Ann gave her talk on "The Orthodox Woman". She is a great story teller, and tells her stories complete with impressions of the various persons important to the story, and it she was not only entertaining, but provided a lot of practical wisdom about the role of woman in the Church, and the raising of children. I had never been present at the consecration of a bishop before, and this was an especially beautiful occasion, to see Vladika John consecrated in the midst of a parish he has had such a long connection with. You can read some interesting commentary on Vladika John's consecration by clicking here. The west side of the Church of the Nativity in Erie. The Icon of the Last Judgment is partially visible. As I mentioned, I missed the first Day and a half of the Conference. Fr. German Ciuba has posted about the conference, and discusses some of the parts I missed. You can read his reflections by clicking here. After Vespers, on Wednesday, we went back to the College for the evening meal... which was especially nice. It was a fast free week, and we took full advantage... having steak (or fish, for those who do not eat beef). There is a picture of this meal here. I was informed that one of the talks had been canceled because the Moscow Patriarchate Bishop who was going to give the talk could not come because of the Bishops Council that was going to be held the following week in Moscow. Consequently, some of the talks I had hoped to hear had already been given. Also, though I was originally going to speak on Saturday, I was informed I would be speaking after breakfast the following day. After the meal, we saw a film about the history of the parish in Erie. You can read about the history here. I was much impressed by the leadership Fr. Pimen had shown in bringing his parish into the Russian Orthodox Church Outside of Russia, led them into using English, and led them into rebuilding their parish after a fire burned down their original Church -- all in a relatively short period of time. There was a period of questions and answers after the film, and Fr. German Ciuba got up to answer a question on the question of abortion... and his rather fervent answer made me regret even more that I had missed his talk. Afterwards, there was a social hour in what was sort of a Student Union building. I spent most of the evening talking to a group of priest who all happened to be citizens of the British Commonwealth: Fr. Andrew Morbey a Canadian OCA priest whom I have known via the internet since the 90's, but had never met in person before); Fr. Geoffrey Korz another Canadian OCA priest, who I had talked with during teleconferences of the Orthodox Fellowship of All Saints of China (as it turned out, his Matushka is also Chinese, and so we had a lot more in common than I was aware); Fr. Andrew Phillips, a ROCOR priest from England; and Fr. 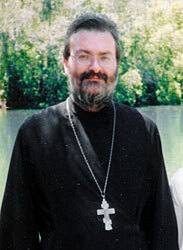 John Behr, who is the dean of St. Vladimir Seminary, and originally from England. Of the 5 of us, we were all converts, except Fr. John Behr, who is from a Russian Priestly family... I had always assumed he was a convert, just based on his name... but that only goes to show that one should not assume. I knew I should be sensible, and should go and get some sleep, but we were the last ones to leave (with the exception of Fr. John Behr, who had been sensible), and had to be scooted out by security. Particularly in my neck of the woods, I don't get to visit with other Orthodox priest with any regularity, and so it always had to pass up the chance to do so. Fr. Victor Potapov arrived at some point that evening, and it so happened that he and I shared a dorm room during the conference. We spoke a few times during the course of the conference, but he might as well have been rooming with Bigfoot, because he only once caught the briefest sight of me in the dorm itself... he too was being sensible. I generally wasn't. The next day, after the liturgy, and breakfast, I spoke. My talk seemed to be well received. I spoke on how Orthodox Christians should and should not interact with those who are not Orthodox, and particularly focused on the pastoral questions that we have in terms of how we should relate to our friends, families, and co-workers who are not Orthodox. I intend to post the text of that talk, but I only prepared an extensive outline, and so that will be in the future. Personally, I find speaking from a text to be very clumsy, and so usually use an outline, even when I giving a talk based upon a complete essay. After my talk, Fr. Andrew Phillips gave his talk on the spiritual significance of the Russian Orthodox Church in the 21st Century. You can read the text of that talk here. I got to meet him in Russia in May of 2007, and have long appreciated his writings, his web site, and the information he provides about the Orthodox history of England. After Vespers, and a break for dinner, next up, was Fr. Victor Potapov of St. John the Baptist Cathedral in Washington, D.C. He had a show on the Voice of America's Russian service for many years, and has a deep and impressive radio voice. You can read his talk by clicking here. It was on the subject of parish life in ROCOR, and I enjoyed his talk very much... I used part of it in my Sunday sermon in the following week. Before I move on to talk about other aspects of the conference, I should make a few additional comments about the practices of the parish in Erie which are different from the more common Russian practice. In the Old Rite, prostrations are made at very specific points in the service, and are unfailingly done by everyone at those points, and are not done at other points. Everyone makes them together. They have a small prayer mat that is about the size of a large pot holder, and is called a podruchnik. When they make a prostration, they toss this mat to the floor, with the decorated side up, plant their hands on it, and make the prostration with their forehead touching the mat. This keeps their hand, with which they make the sign of the cross, from touching the floor. As they rise, they pick up the mat, fold it, and set it aside, or tuck it into their belt. They do all this with such a smooth flowing motion, that I was hesitant to even try it at first, but parishioners would offer me a podruchnik, and so eventually I did use it, though not with the grace of those more use to it. Also, while standing during the services, the Old Rite practice is to cross your arms across your chest, with your hands tucked under your arms. This is another one of those things you have to see, but you can see a picture of it here. Another very positive thing you see in the services is the participation of the youth. You see small boys tending to the lamps, or serving in the altar. Young ladies reading the Psalter, or singing in the choir. There seems to be a very intentional plan of getting as many young people involved as possible. In fact the number of people in general you see actively involved in making the services happen in one way or another is very impressive. This is the way you keep a parish alive. Many bells went off for me during this conference, such as this one. Click here to see the Pantocrator icon, with the surrounding icons on the ceiling. Aside from Saturday evening, and Sunday morning, there was a daily cycle of services throughout the conference. At 5:45 a.m., they did Matins. At 8:15 a.m., the Hours and Divine Liturgy, and then at 4:30 p.m., they did Vespers. These services had a way of drawing the conference attendees into the life of the parish, unlike any conference I have previously attended. I spent the better part of last week at the 2008 Orthodox Conference in Erie, Pennsylvania. Because of my secular job, I was unfortunately unable to catch the first day and a half of the conference, and as a result I missed some really good lectures... though they were recorded, and I hope to at least be able to hear them when that is made available. I have driven through Erie before... once during a blizzard, but had not had the chance to see the parish there before, though I have wanted to for some time. Not long after I came into the Orthodox Church, I was given a copy of the first edition of the Old Rite Prayer Book published by that parish, and so have developed an interest in the Old Rite... though outside of books, I had never seen a proper Old Rite service. Erie is not a big city. When I flew into the Erie airport, there was no trouble finding the right baggage claim carousel... there was only one. On the wall of baggage claim was the skyline of the city, and off to the right, very prominently was the Church of the Nativity... one of the most beautiful Churches I have seen in the United States. Aside from the services, most conference activities, as well as the lodging, were at Mercyhurst College. After checking in, I went straight to the Church, because I had just gotten in in time for Wednesday evening Vespers. The Iconography in the Church is of the finest quality, but is inscribed almost completely in English. The services there are normally done almost completely in English. This may seem a bit ironic, given that the Old Believers separated from the rest of the Russian Church because they refused to accept changes to the translations of the services, as well as changes in some of the rubrics. However, this parish, which began as a Bezpopovtsy (Priestless) Old Believer community came to a realization that their community would eventually die, if they did not introduce English, because subsequent generations had an increasingly hard time with the Slavonic, and their work on translating the services actually led them to reconciliation with the Russian Orthodox Church Outside of Russia, and their community becoming a Priested Old Rite community. In fact, this conference was held in Erie to mark the 25th anniversary of their reconciliation with ROCOR. The singing is done in Znamenny chant, which sounds very much like Byzantine Chant because that is where it has its roots. It is the oldest form of Russian chant. They have two choirs -- a women's choir on the left, and a male choir on the right. I was told that this was not always the case, but that the singing used to be done by the men only -- however, during World War II, when most of the men were away, the women had to do the singing, and then after the war, the women didn't want to stop... and apparently the men either didn't try to make them stop, or were unsuccessful if they did. The singing is exceptionally well done, and the acoustics in the Church combined with the quality of the singing made for a very powerful experience. A visitor is also struck by the fact that the women (including young girls) in the parish are consistently attired in head-scarfs (most often, white), long sleeve shirts or sweaters, and long dresses. As for the men, those who are not clergy (in major or minor orders), were wearing a traditional Russian Kosovorotka, and a belt. As I said, I had never seen the Old Rite in actual practice, and was struck by the way the people were censed. When the deacon would cense them, they would face the deacon with both arms raised in an orans, and then would bow towards the deacon, and then turn, and make the sign of the Cross towards the altar. The scriptural basis for this practice is "Let my prayer be set forth as incense before Thee, the lifting up of my hands as an evening sacrifice" (Psalm 141:2, in the KJV). This was particularly striking when the choir was censed. I was generally standing behind the male choir, and so could not see their faces when they were censed, but when the women's choir was sensed I could... and it is something you would have to see. They would be standing in a semi-circle around the music stand singing, all nearly uniformly attired, and then as a group, they would all turn at the same time to face the deacon with their hands raised, then do the bows as I described, all the while never missing a beat with what they were singing... despite the fact that they all had their eyes off the music book while doing so. You can see a picture of the women's choir, by clicking here. It was worth going to the conference, just for the services. Click here for a slide show of our parish move and first liturgy at our new location. This is the beginning clip of a full length animated film about the Monkey King, that was done in China just before the cultural revolution shut that sort of thing down. Though it is all in Chinese, I think it is a fun movie to watch. This was my oldest daughter's favorite cartoon when she was a toddler. At the beginning, when the Monkey king burst of the rock, she use to jump up and down saying "Malo! Malo!" ("Monkey!"). The lyrics are from a poem by St. Nikolai Velimirovich, one of the great Serbian saints of the modern era. Christ is risen! Let us rejoice! From "The One Thing Needful", by Archbishop Andrei of Novo-Diveyevo. There lived a family — a grandmother and grandson. The grandson was an Imperial Guardsman. His parents had died when he was still young, and his grandmother took their place. They were magnates, incalculably rich, millionaires. Vladimir, as this officer was called, while still a young man become satiated with everything that only the life of wealthy Russians could provide at that time. Like the life of the rich man in today’s parable, his life was spent in gaiety and carousing. He had a good heart and his friends loved him as a person from whom they could always get anything they wanted. The word "no" did not exist for him. But once his grandmother called Vladimir and said: "Vladimir, after my death, you will have no one. Your friends will strip you of everything, and you will perish a lonely, unfortunate man. Get married." Vladimir answered, "All right, Grandmother, I will get married." The grandmother found a fiancée for him — a princess from an impoverished family. Vladimir danced with her two or three times at parties and proposed to her. And then, because the wedding was set for only after the Christmas season, and Vladimir’s life went on in its routine way — in a fog of merry-making and revelry — he wouldn’t even have been able to remember her name right away. And if he had met her on the street, he probably wouldn’t have recognized her. Yet the closer the wedding day approached, the more troubled his soul became. And finally came the second day after the Baptism of Christ. He had to go to his army office in order to get his salary and his vacation for the honeymoon. This was the first time he had gone out in St. Petersburg at such an early hour and, moreover, in a sober state. Usually, when he was traveling in Petersburg at this hour or still earlier, it was after a night spent in extreme debauchery, and then he was usually dozing off, oblivious to his surroundings. But today, as if for the first time, he saw Petersburg during working hours. On everything lay the impression of the businesslike seriousness of a morning in a metropolitan city. And upon his soul there lay, like a heavy stone, something unusually businesslike and serious: marriage, family life, obligations which he never had, never knew. Upon arrival at his office, he received his papers and money — his large purse was filled with gold coins. When he went out, he wanted to be alone and walk. He ordered the driver to follow him on the roadway, and he himself walked on foot. Without noticing it, he reached the cathedral of the Kazan Icon of the Mother of God. Just at that moment the bell rang. And for the first time, he felt drawn to enter church. Of course, he had been to church services, moliebens and pannihidas, but only because this was required by his social standing. But now, an inner need manifested itself. The cathedral was plunged in a cozy half-darkness. The Miraculous Icon was simply shining in brilliance. In spite of the winter season there were white lilies. The reading of the Akathist (Molieben — a petitionary service. Pannihida — a requiem service for the dead. Akathist — a service in honor and praise of Jesus Christ, the Mother of God, or one of the saints.) was still going on. There was a deep prayerful singing, a multitude of candles and devotion lamps, and more and more people — praying, weeping. Vladimir froze. He had not prayed for a long, longtime. All he could say was: "O Mother of God! I am coming to a turning point in my life. If it has to be so, help me. But if all this is not necessary, stop it." And here, he himself thought that this was no way to pray, that he didn’t even know how to pray. Suddenly someone tenderly touched his sleeve. It was a beggar woman with a child in her arms. "Sir, help me," she whispered. He thrust his hand into his pocket, pulled out his large purse, and put it in her hand. Because of the weight of the purse, she almost dropped it. "Sir," she exclaimed, "I cannot take it. People will say I have stolen it." "Don’t be afraid, my card is in the purse. Say that I gave it to you." "Sir, and what about you? You are giving away everything...and yourself?" "Don’t you understand, I have everything, I don’t need anything." "All right, I will take it. But know this: you are saving two lives — mine and my child’s. How can I repay your kindness?" "You know what? Yes, you can help me. I don’t know how to pray; but I am in need of prayer, right now, for my soul. Otherwise I will perish." She looked at him with a long, compassionate look. She bowed and disappeared into the crowd. But then he saw her again. She approached the Miraculous Icon, put her baby on one of the steps before the Icon, and started praying and making prostrations. Tears were streaming down her pale face. A shiver ran down his spine. He understood. This was a prayer for him. He quickly walked out of the church, went one block until he reached Great Konushenna Street. After the semi-darkness of the cathedral, the bright sun on the white snow blinded him. He felt a sharp, sudden pain in his eyes, then in his head, and he lost consciousness. When he recovered, he sensed that he was lying on a table in his full Guard’s uniform. He had fallen into a lethargic sleep (Lethargic sleep — a comatose condition in which all bodily functions become undetectable and the person appears to be dead), and now he was starting to wake up. He still couldn’t move, couldn’t open his eyes, but he heard everything. Only he thought that he had died, and everything he heard he accepted as if he were dead. And everyone around him was sure that he was dead, and they prepared him for burial. And now he understood the reverse side of life. He heard two voices — male and female. The man’s voice said: "At least for the sake of decency, put your handkerchief to your eyes. After all, he was your fiancé." And the female voice said: "Papa, you know how I hated and despised him. Only your debts made me agree to this marriage. I cannot continue this comedy." And then his friends approached. All of them were in debt to him. "How wonderful that Vladimir died, and I don’t have to pay back what he, good man that he was, loaned to me." And so more and more all the hypocrisy of the life he had been living was revealed to him. The tears of only one person were sincere. His nurse, who had taken the place of his father and mother, was sobbing. Then they started to read the Psalter. Before, he had not understood them; but now, each word of the Psalms excited his awakening soul. All the depth of God’s Mercy was revealed to him. God’s Truth was revealed against the background of human lies. And then he heard a movement. He understood, the clergy had come and they were starting to serve the pannihida. And when they began to sing: "With the Saints give rest...," and when they lifted his body to put it in the coffin, he caught his breath, recovered consciousness and began to move. Out of fear, the bearers dropped the coffin and ran out of the room. Vladimir remained alone. But by now he was not the same. In the middle of the empty room stood the renewed Vladimir. When everything had calmed down, he divided all his property. Half he gave to his fiancée and all the rest to the poor. And he forgave all the debts. Soon afterwards, he became a monk and finished his ascetic life as archimandrite of the Kostroma Monastery. This is how the Word of God renews a man! Today, we finished moving into our new facility. We have a lot left to do, but we had our first service there this evening. I'm tempted to put up a sign with one word: "...not!" Yesterday (fittingly on the anniversary of the signing of the act of canonical communion), Metropolitan Hilarion was given the white klobuk of a Metropolitan. Axios! Axios Axios! One year ago today, I was in Christ the Savior Cathedral, witnessing the reconciliation of the Russian Church. What a blessing it was to be there, and what a blessing this event has been to our Church ever since. To read all about it, click here. After all... half the country went into rebellion because he was elected, and the other half were not very happy with him for most of the time we was president. A clip from a fun old movie. Russia Today has a video news clip on this. 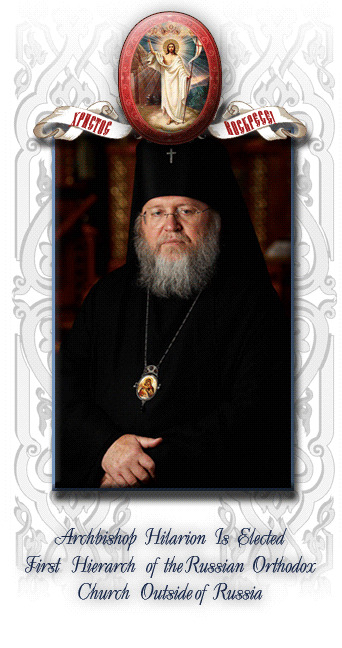 On May 12, 2008, at 12:00 noon, at the Synodal Cathedral of Our Lady of the Sign in New York, His Eminence Archbishop Hilarion of Sydney, Australia and New Zealand was elected Primate of the Russian Orthodox Church Outside of Russia, and shall be elevated to the rank of Metropolitan. In accordance with the Act of Canonical Communion signed on May 17, 2007, the Council of Bishops will send the Act of Election, drawn up by the Counting Committee, to His Holiness Patriarch Alexy II of Moscow and All Russia, with a request from the elected First Hierarch for his blessing to assume the duties placed upon him by his brother archpastors, and for confirmation by the Holy Synod of the Moscow Patriarchate of his election. The Enthronement of His Eminence Metropolitan Hilarion of Eastern America and New York, Primate-elect of the Russian Orthodox Church Outside of Russia, will be held on Sunday, May 18, 2008. May 17, all-night vigil at 6 pm. At the end of the evening service, the newly-elected Primate will emerge from the Royal Doors in a black klobuk [monastic headdress] and a simple episcopal mantle and will stand on the ambo facing the people. Two senior bishops will bring the light blue mantle and white klobuk to the Metropolitan, who will don them with the help of subdeacons. During the vesting of the mantle and klobuk, the senior bishop will intone "axios" ["he is worthy"], which will be repeated first by the bishops and clergymen, then by the choir. Afterwards, the Metropolitan will bless the clergy and people. The light blue mantle and white klobuk will first be blessed with holy water by the senior archbishop during the reading of the first hour. May 18, Divine Liturgy at 9:30 am. After the entry prayers are read and the customary blessing, two senior bishops will lead the new Metropolitan to the vesting platform and will declare "axios," which will be repeated first by the bishops and clergy, and then by the choir. The newly-elected First Hierarch will then be vested in the middle of the church, while the other bishops are vested in the altar. Thereafter, two senior archimandrites or protopriests will bring out the mitre and will silently present it to the Primate of the Russian Orthodox Church Outside of Russia. "May the Almighty and Life-giving Trinity, Boundless Sovereignty and Indivisible Kingdom, grant to you this great throne of episcopacy, to be Metropolitan and Primate of the Russian Church Abroad, through the election by your brethren, the bishops of the Russian Church Abroad. And now, lord and brother, accept this pastoral staff, and ascend the throne of the episcopal seniority, in the name of our Lord Jesus Christ, and beseech His Most-Pure Mother for all Orthodox Christianity and for the Russian people in the diaspora entrusted to you and save them as a good pastor will, and may the Lord God grant you health, well-being and many years." The Archdeacon will then intone Many Years to the new First Hierarch of the Russian Orthodox Church Outside of Russia. The choir will sing Many Years. "May the Almighty and All-Sovereign Right Hand of the All-Highest preserve and strengthen us all. May He grant peace and calm to His Holy Church and save our Fatherland from enemies visible and invisible, and grant strength to Orthodoxy. And to you, brother archpastors of the Russian Church Abroad, and to all Russians in the diaspora, and all Orthodoxy Christians, may He grant health and many years." The choir then sings Many Years (without an intonation by the Archdeacon). This week the bishops of the Russian Orthodox Church Outside of Russia will elect a new head. Russia Today has a report on the opening day (Sunday, May 11th). This is one of two songs that were sung at my wedding. It was a Protestant wedding, at a Chinese Baptist Church (this was about two years before I had any idea of what Orthodox Christianity was), and there aren't many singers who can pull off a Keith Green song like Keith Green... the singing at our wedding was not nearly as good as this guy in the video. Russian Orthodox businessmen have represented a project called Seven Churches per Day. They are concerned about the lack of Orthodox churches in majority of bedroom communities of Moscow, where criminality, drug addiction and alcoholism are spread. To fast increase the number of churches a new construction technology has been developed. Thanks to the innovation a church can be built for 24 hours. The churches are made from timber saturated with special solutions preventing rot. There are two types of portable churches: a 15 meter high big one able to house 150 people and a small one of 12 meter height and 49 square meter area. The cost of the small church is 2 million rubles. The first church of this kind is expected to open on the 6th of April in the town of Kemerovo, then the portable churches will appear in Moscow, Kiev and Minsk. Moscow Patriarch’ Office has backed the project. Click here for several clips. The Orthodox Houston Clergy Association in conjunction with Ancient Faith Radio is now posting podcasts from sermons and lectures in the Houston area. The first installment was my talk given on the Sunday of Orthodoxy. As it turned out, I had been asked to speak about the reconciliation of the Russian Church, but earlier that day Metropolitan Laurus had reposed, and so I did not stick very closely with my original notes. You can listen by going to this page. When he began to appear on television screens four years ago, he seemed a strange man for the Russian public. Bearing the high title of Metropolitan of East America and New York, he was dressed accordingly. He met with President Vladimir Putin and Patriarch Alexy II and then signed on May 17, 2007 the historical act on communion of the Orthodox Church in Russia and abroad, thus putting an end to the tragic division of the Russian people in the 20th century. He was ceremoniously met around the country and showered with orders and prizes. But his image starkly contrasted with the image of a church authority or, for that matter, any other leader that we are used to. The apparently feeble old man was inarticulate and barely audible. During solemn services, he moved around without due pomp. He constantly seemed pensive or sleepy. Receiving awards from top Russian leaders, when it’s just about time for a high-flown patriotic speech, he would say modest thanks, but mainly a homily – on the Holy Trinity, for example, or on Divine Love. How did it happen that it was this man, who did the seemingly impossible – with very little losses led his Church, many of whose members saw its raison d’être in opposing the “Soviet” Moscow Patriarchate, toward a unity with the Church in Russia? Today, looking back at his life or listening to the testimonies of those who knew him personally, one sees not only another dramatic fate of an outstanding representative of the Russian diaspora. What we see is the often trite stilted notions of a monk, pastor, active love, humility and faith in God coming alive, and the conventional forms of a bishop’s service revealing its original essence. The monastic tradition so outstandingly represented by the late hierarch is traced to the Pochaev Monastery in Volynia (today, the Ternopil Region of Ukraine). 11-year old peasant son Vasily Shkurla started in 1939 as a novice in a monastery in the village of Ladomirova, Slovakia, which was founded by a Pochaev monk and later archbishop Vitaly (Maximenko). The future metropolitan was an ethnic Carpatho-Russian (or Ruthenian), thus representing a small Slavic people with a Russian self-consciousness, which found itself in the Austro-Hungarian Empire and suffered a great deal for its traditional Orthodox Christianity and Russian orientation. Ladomirova monks were active in publishing. They continued it in Jordanville, in rural Upstate New York, where they moved in 1946, when the Red Army came to Slovakia. In 1948, Vasily Shkurla was tonsured as a monk and given the monastic name Laurus. He began to teach in ROCOR’s only seminary in Jordanville, while still a senior. Later, he became an academic supervisor while running the monastery’s office and book warehouse at the same time, and was famous for his borscht. “He bore the burden of running the monastery,” Lokhmatov said. In 1967, Laurus became the Bishop of Manhattan and secretary of ROCOR’s Synod. In 10 years, he returned to the monastery as its abbot and Bishop of Syracuse and Holy Trinity. For many Orthodox Christians in the Soviet Union, it was the literature published in Jordanville and smuggled across the border that served as both a breath of fresh air and the only connection to the part of the Russian Orthodox Church behind the “iron curtain” that was not controlled by the Soviet power. Perhaps, for Laurus too, the connection to Russia through the publishing work became the seed from which his service to the church unity grew. In 1986, when the ROCOR head, Metropolitan Philaret (Voznesensky) died, the much loved Archbishop Laurus was seen by his flock as the most likely candidate for the metropolitan’s post. But the Church was led instead by Metropolitan Vitaly (Ustinov), who was notorious for an extreme intolerance toward the Moscow Patriarchate. When the Church in Russia was liberated and the reasons for an essentially political schism would be seemingly exhausted, a stark confrontation began in place of unification. ROCOR opened its parishes in Russia and put forward new claims to the ROC. The Moscow Patriarchate, in turn, claimed ROCOR properties in foreign countries. Meanwhile, Archbishop Laurus devoured news from Russia and rendered quiet support to the forces within ROCOR who spoke against the anti-Moscow policy, often facing ostracism. For example, he let the convention of the St. Seraphim Foundation, whose head, Protopresbyter Alexander Kiselev, openly criticized the opening of ROCOR parishes in Russia, and thus caused fury on the part of the hierarchy. When the ROCOR official paper condemned the transfer in 1991 of the relics of much revered St. Seraphim of Sarov from St. Peresburg to Diveevo in Nizhny Novogorod region as “false” relics in a “graceless” church, Laurus did not criticize the article, but went incognito to Diveevo and celebrated a service on these relics. When it became known, the talk of “gracelessness” stopped on its own. 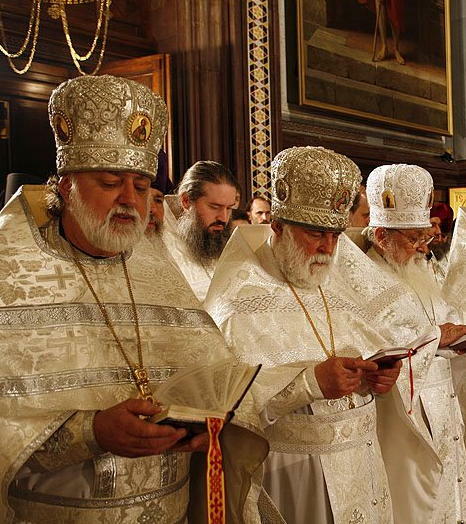 The internal processes leading to reunification began in the ROCOR long before Putin’s landmark meeting with the hierarchs of this Church in November 2003. In 2001 Metropolitan Vitaly retired, but announced later that he was forced to do it and found himself ultimately in a schism – one of many in the ROCOR, while its main part reconciled with the Moscow Patriarchate. Laurus was then elected Metropolitan. After the meeting with Putin and the first official visit to Russia of a ROCOR delegation in May 2004, a complicated negotiation process began. According to its participants, the talks were on the verge of breakdown several times – so different were the experiences and approaches of the two parts of the Russian Church. When the prospect of reconciliation became real, the discord within ROCOR grew. There were many who disagreed. Lokhmatov recalled how painful the discords were for the metropolitan, but he did not show his emotions. Due to his spirit of peace, which is marked by everybody who met Laurus at least once, the number of breakaway parishes was minimized and numbered several dozen mainly in the former Soviet Union, where people came to ROCOR primarily out of their opposition to the official church. And overall, his leadership was as quiet as his entire ministry. Should one say that Metropolitan Laurus’ passing is the kind of death that Orthodox Christians, who pray daily “for a Christian end to our lives, peaceful, without shame and suffering,” can only dream of? Having achieved the goal of his life, having returned from beloved Russia just over two weeks before, having celebrated all the services of the first week of Lent except Saturday, when he fell ill, the 80-year-old elder quietly died in his sleep while the Church was celebrating the Sunday of Orthodoxy. According to the ROCOR statutes, the first hierarch is elected at the gathering of all bishops – the Synod. Each of the 11 present bishops of this self-governed part of the Russian Orthodox Church can be a candidate. According to the Act on Canonical Unity signed last year, the elected metropolitan has to be confirmed by the Patriarch of Moscow and All Russia. 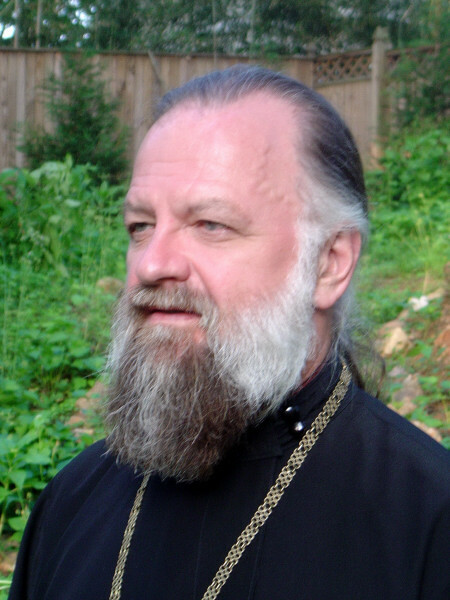 The temporary head of the ROCOR after Metropolitan Laurus’ death is his first deputy, Archbishop Hilarion (Kapral) of Sydney, Australia and New Zealand. As a person closest to Metropolitan Laurus in his spirit and views, he is named by sources within ROCOR as the likeliest successor to Metropolitan Laurus. Another possible candidate is Archbishop Mark (Arndt) of Berlin, Germany and Great Britain. 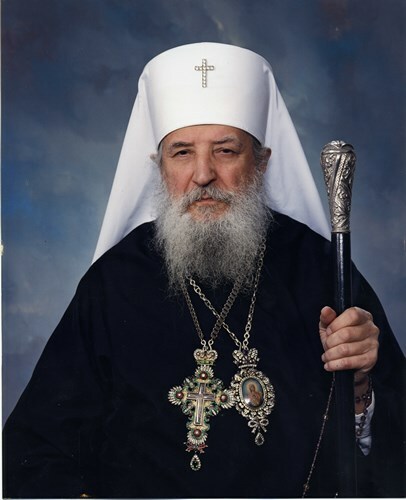 Metropolitan Laurus will be buried in Jordanville on Friday March 21st, ROCOR announced. On June 28, 1914, Gavrilo Princip shot the archduke and heir to the Austrian throne Franz Ferdinand in Sarajevo, setting in motion the train of events that led to the First World War. In the spring of 1999, the United States bombed Serbia for 78 days to force its army out of that nation’s cradle province of Kosovo. The Serbs were fighting Albanian separatists of the Kosovo Liberation Army (KLA). And we had no more right to bomb Belgrade than the Royal Navy would have had to bombard New York in our Civil War. We bombed Serbia, we were told, to stop the genocide in Kosovo. But there was no genocide. This was propaganda. The United Nations’ final casualty count of Serbs and Albanians in Slobodan Milosevic’s war did not add up to 1 percent of the dead in Mr. Lincoln’s war. Albanians did flee in the tens of thousands during the war. But since that war’s end, the Serbs of Kosovo have seen their churches and monasteries smashed and vandalized and have been ethnically cleansed in the scores of thousands from their ancestral province. In the exodus they have lost everything. The remaining Serb population of 120,000 is largely confined to enclaves guarded by NATO troops. On Sunday, Kosovo declared independence and was recognized by the European Union and President Bush. But this is not the end of the story. It is only the preface to a new history of the Balkans, a region that has known too much history. By intervening in a civil war to aid the secession of an ancient province, to create a new nation that has never before existed and, to erect it along ethnic, religious and tribal lines, we have established a dangerous precedent. Muslim and Albanian extremists are already talking of a Greater Albania, consisting of Albania, Kosovo and the Albanian-Muslim sectors of Serbia, Montenegro and Macedonia. If these Albanian minorities should demand the right to secede and join their kinsmen in Kosovo, on what grounds would we oppose them? The inviolability of borders? What if the Serb majority in the Mitrovica region of northern Kosovo, who reject Albanian rule, secede and call on their kinsmen in Serbia to protect them? Would we go to war against Serbia, once again, to maintain the territorial integrity of Kosovo, after we played the lead role in destroying the territorial integrity of Serbia? Inside the U.S.-sponsored Federation of Bosnia and Herzegovina, the autonomous Serb Republic of Srpska is already talking secession and unification with Serbia. On what grounds would we deny them? The U.S. war on Serbia was unconstitutional, unjust and unwise. Congress never authorized it. Serbia, an ally in two world wars, had never attacked us. We made an enemy of the Serbs, and alienated Russia, to create a second Muslim state in the Balkans. By intervening in a civil war where no vital interest was at risk, the United States, which is being denounced as loudly in Belgrade today as we are being cheered in Pristina, has acquired another dependency. And our new allies, the KLA, have been credibly charged with human trafficking, drug dealing, atrocities and terrorism. And the clamor for ethnic self-rule has only begun to be heard. Rumania has refused to recognize the new Republic of Kosovo, for the best of reasons. Bucharest rules a large Hungarian minority in Transylvania, acquired at the same Paris Peace Conference of 1919 where Croatia, Slovenia and Bosnia-Herzegovina were detached from Vienna and united with Serbia. Abkhazia and South Ossetia, two provinces that have broken away from Georgia, are invoking the Kosovo precedent to demand recognition as independent nations. As our NATO expansionists are anxious to bring Georgia into NATO, here is yet another occasion for a potential Washington-Moscow clash. Spain, too, opposed the severing of Kosovo from Serbia, as Madrid faces similar demands from Basque and Catalan separatists. The Muslim world will enthusiastically endorse the creation of a new Muslim state in Europe at the expense of Orthodox Christian Serbs. But Turkey is also likely to re-raise the issue as to why the EU and United States do not formally recognize the Turkish Republic of Northern Cyprus. Like Kosovo, it, too, is an ethnically homogeneous community that declared independence 25 years ago. Breakaway Transneistria is seeking independence from Moldova, the nation wedged between Rumania and Ukraine, and President Putin of Russia has threatened to recognize it, Abkhazia and South Ossetia in retaliation for the West’s recognition of Kosovo. If Putin pauses, it will be because he recognizes that of all the nations of Europe, Russia is high among those most threatened by the serial Balkanization we may have just reignited in the Balkans. Friday, February 22, 2008 3:00 p.m. – 9:00 p.m.
Saturday, February 23, 2008 11:00 a.m. – 5:00 p.m.
Sunday, February 24, 2008 12:00 p.m. – 5:00 p.m.
Click here to see Photos of our Icon Exhibit in 2005. Click here to see Photos of our Icon Exhibit in 2006. 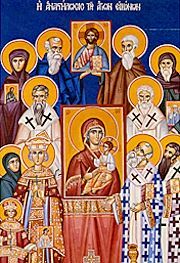 Click here to see Photos of our Icon Exhibit in 2007.
exquisite examples of Orthodox Christianity in the traditional style of the Russian schools. Ethnic pastries and beverages will be for sale in our Tea Room. or call 281-288-5558 or 281-467-0264. This is a song that you've probably heard made fun of over the years (usually with just the refrain being heard), but considering the context of suffering that it originated from, it is actually a very beautiful song. A stone seal bearing the name of one of the families who acted as servants in the First Temple and then returned to Jerusalem after being exiled to Babylonia has been uncovered in an archeological excavation in Jerusalem's City of David, a prominent Israeli archeologist said Wednesday. The 2,500-year-old black stone seal, which has the name "Temech" engraved on it, was found earlier this week amid stratified debris in the excavation under way just outside the Old City walls near the Dung Gate, said archeologist Dr. Eilat Mazar, who is leading the dig. The Bible refers to the Temech family: "These are the children of the province, that went up out of the captivity, of those that had been carried away, whom Nebuchadnezzar the king of Babylon had carried away, and came again to Jerusalem and to Judah, every one unto his city." [Nehemiah 7:6]... "The Nethinim [7:46]"... The children of Temech." [7:55]. The seal of one of the members of the Temech family was discovered just dozens of meters away from the Opel area, where the servants of the Temple, or "Nethinim," lived in the time of Nehemiah, Mazar said. "The seal of the Temech family gives us a direct connection between archeology and the biblical sources and serves as actual evidence of a family mentioned in the Bible," she said. "One cannot help being astonished by the credibility of the biblical source as seen by the archaeological find." The archeologist, who rose to international prominence for her recent excavation that may have uncovered King David's palace, most recently uncovered the remnants of a wall from Nehemiah.